VMware is very useful for learning and testing purposes. You can run multiple virtual machines at the same time in VMware. But if you forgot the administrator password of your Windows virtual machine, it seems that there is no other way but to rebuild a new machine. It's a time-consuming task for most of us. 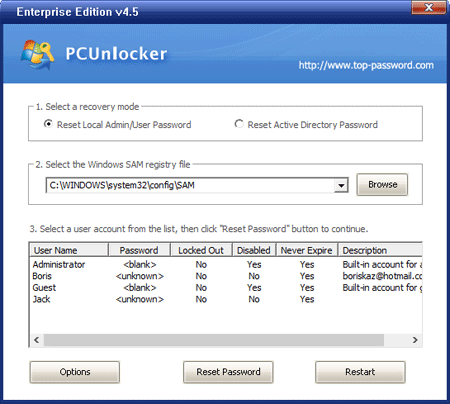 PCUnlocker can be a lifesaver for helping you reset lost or forgotten administrator password of any virtual machine. Follow the simple steps below to unlock your virtual PC instantly. 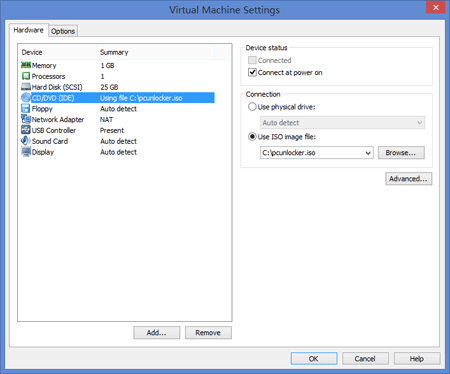 Launch VMWare Workstation, Click on the File menu, select Open to open your existing virtual machine. Double-click on the CD/DVD device, you will see the Connection properties for this device. Click on Use ISO Image, then browse to the ISO image file: pcunlocker.iso. 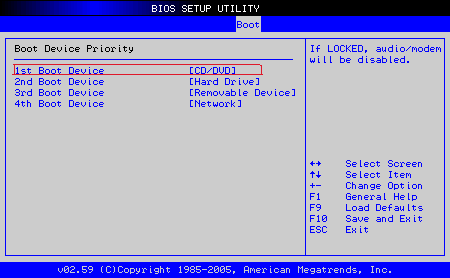 Click on the VM menu, then select Power -> Power On to BIOS, your virtual machine will automatically run into BIOS Setup Utility. Set the 1st Boot Device to CD/DVD. Press F10 to save your changes. After successfully booting from the CD ISO image, the computer will load the WinPE operating system and start the PCUnlocker program after a while. Simply select your Windows SAM registry hive, the program will display a list of Windows user accounts. Select the administrator account, then click the Reset Password button to reset the password to blank. Click the Restart button to reboot the virtual machine, you are able to log in to the administrator account with a blank password. It is that simple. PCUnlocker allows you to easily reset lost administrator and user password for all versions of Windows, including Windows 10. If you need to reset forgotten password for a EFI/UEFI-enable virtual machine, please use the Enterprise edition of PCUnlocker which supports both 32-bit UEFI and 64-bit UEFI.